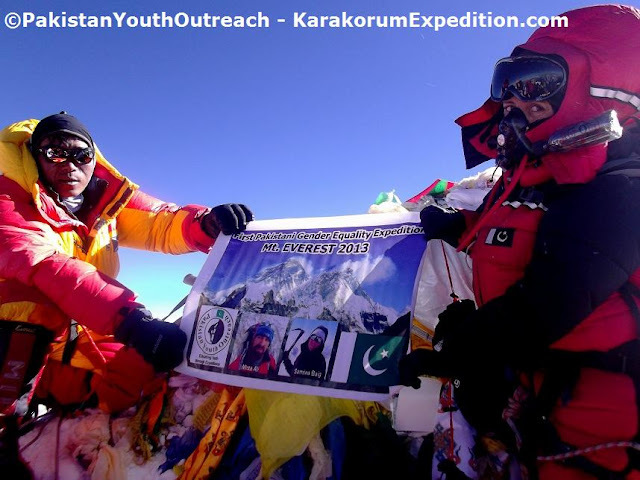 BREAKING NEWS, today at 7:40am local time Samina Baig has reached the Summit of Mt Everest together their team mates, the Indian twin girls Tashi and Nugshi - at the age of just 22 years, Samina is the first Pakistani woman to summit the world´s tallest peak! Congratulations Samina, Congratulatins to the Team, Congratulations Pakistan! 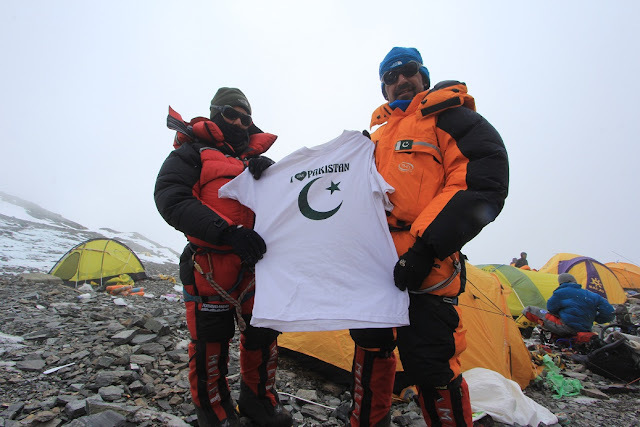 I couldn't sleep long enough, there was a kind of dream or thought that, the radio message says Samina Reached the summit,when i woke up there was no one around, the weather was perefect and i was thinking that every thing is going to be fine and i was confident that she is going to make it on the top! i had mixed feeling at south col. while in our tent, Mingma appeared form some where, he had the radio sat, i insist him to contact Norbu or Lakhpa, he did several tries but there was no response from the summit, there were news coming and the first form our Seven Summit Team was Our Arjun karki Dai,( the Nepali Actor) he spent two nights at south col.before reaching summit. 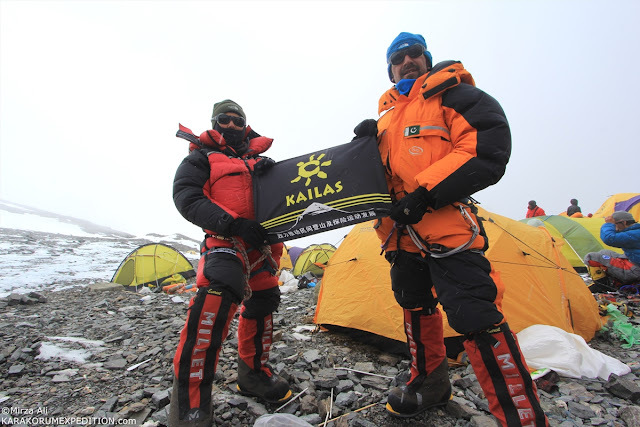 then there was NO news until the NEWS BREAK FROM THE SUMMIT THAT SAMINA BAIG REACHED THE SUMMIT WITH NORBU SHERPA AND LAKHPA! there was JOY ,JUBILItion and tears in MY eye, this was incredible FEELING! Mingma was there next to my tent and sharing the news from summit, Norbu! 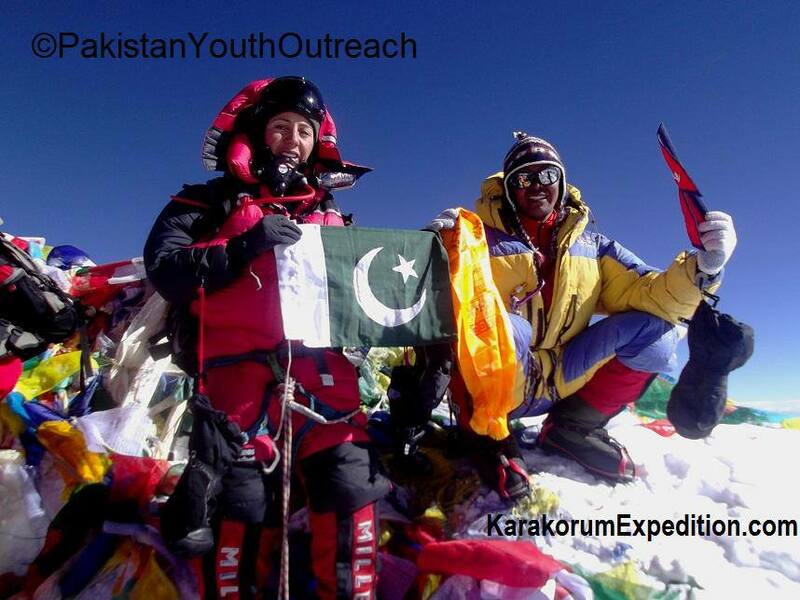 Said"WE are on the summit and Samina Made it to the "TOP" waw this was extreme moment of MY life Happiness! 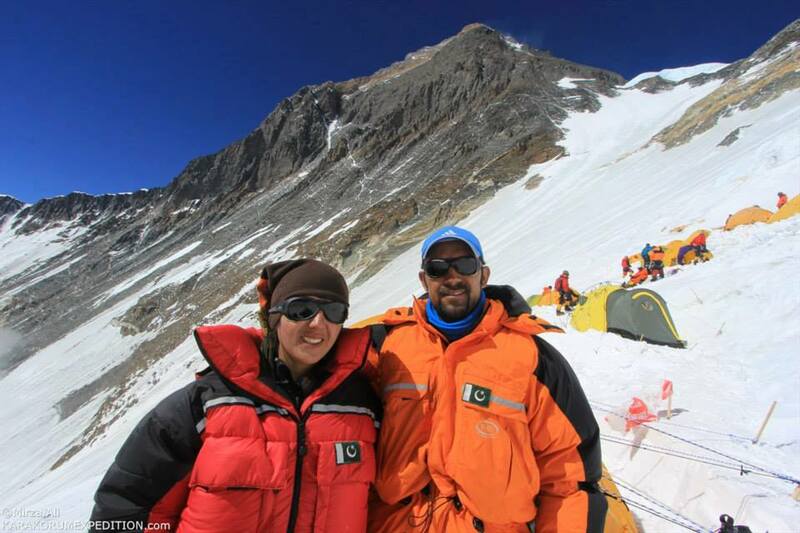 this was the DAY i wanted for 7 years ,the mission accomplished first Female from Pakistan made it to the summit, the first female without reaching any summit higher than 6400m, this was HISTORICAL! this was something VERY NEW in pakistan Adventure HIstory!it took 60years for a pakistani woman to reach the summit of any 8000r,specially mount EVEREST! this was a feat truly REmarkable ! as i spoke to Samina just few words that was also distored..but i could hear hear her ,she is on the TOP of the world! since my Satellite phone battery was almost dead, because it turned on while i left for CIV from CIII, and when you go higher and colder the battery dies quickly, i could manage to SEND the BREAKING NEWS ACROSS PAKISTAN to main people i had on my contact list. there the News broke all over pakistan, meanwhile my phone battery died. i was desperate and waiting for the time to see samina back to CIV, i tried to sleep but the joy was too much, i couldn't sleep, then i saw Mingma going down with Mr.Swee, i went few time to talk with Minga dai, who was looking after for Chines clients. he had he Radio sat so could contact with other sherpas on the mountain, the grea thing was that, Seven Summit Treks have given Radio sat to each group, client ,so that was easy to communicate, but there was NO contact with Lakhpa or Norbu after the summit, I melt water and was ready to make soup or tea, then i saw People descending to south col. when i saw and recognize Tashi Nungshi, i went to Greet them, we huged and was grea feeling, Samina was behind them, i was little worried , i was on the foot of the glacier that leads to Black parymid, i wait and then finally i could spot Samina the tiny girl climbing down , i saw Lakhpa too ,then the moment of JOY came when we hugged and cheered for the great HISTORICAL SUMMIT! this was the mission that i carried for six years and on 7th year it was fulfiled, i thank Almighty for his GREAT stregnthen and Help. i led samina to the tent,gave them water that i melt and then rest for a while, some soup and then finally ready to descent to Camp III or Camp II,while the soup was in making, i took two packs of dehdrate meal for Tashi & Nungshi, they were tired and had put off their downsuits,i told them be ready around half past two ,that we are going down.After Samina and Lakhpa Dai ,finished with soup , we put our gears,Lakpa dai was carrying the extra oxygen bottles and some gears , me and Samina left for Camp III. i didn't put my crampons ,so Samina, getting close to the head of Geneva spur, Lakhpa dai told us to put the crampons on, Samina did put the Crampons but i wanted to go without Crampons till Yellow Band, the route was now clear,most of the climbers had reached Camp IV those who had weather window for 2oth of May, we start decending, we progressed fast and pretty quick, above Yellow band, i slept and had big fall,luckily i had double safety and i arrest myself with help of rope,Samina was shouting at me, i stand up and start putting my crampons, Lakhpa dai was tired and was slow ,he was also carrying load, going down near to Yellow Band there was shout and scream, i turned back and saw Samina bag is on top of her and she is hanging on the rope,she was then silent, she was scared but she was attached to rope, i run back and climbed down two steps to reach her, then Lakhpa reached too, we lift her,she had one saftey rope ,i removed mine and put her on two saftey, our descent was progressing very slow,since Lakha and Samina both were very tired, descending Yellow band was kind of HELL. she couldn't climb down, this section is hard rock and was difficult to climb down the rock section while you are tired, however i insist her and she replled down ,through the Lhotse face travers and descending Lhotse face was a Hard job for samina, she was fine going, then the sun was up and the clouds disappeared, with down suits,produced for -40 in heat is very difficult to climb either way, however she was going good, after Yellow Band we were fast,didn't sit for any rest, we kept descendng, Lakhpa had our another Bottle of water, we finished my bottle of water, and going down was gettign hard because samina was very thirsty and there was no water! the Indian Army Team were behind us , one of them passed us and i asked if he has water but he had not, i then carried Samina oxygen bottle her back pack and start descenting, at upper Camp III, i met Ben our friend from Alpine ascent, i called for water and when i went near to their camp, there was an unstable cravers with soft snow over the mouth, luckily there was old ropes from previous years, i wrapped one end over my waist and jump over the cravers,i Saw Ben and the Arab Sheikh, and few other clients of Alpine Ascent, they gave water and i gave it to Samina, She drunk nearly entire bottel (1liter) .the she got the pace and energy to start going down, i was carrying her oxygen bottle and bag pack all the way down below Lhotse face travers. to Camp III. Samina was slow and Behind me,i reached Camp III. the Indian Army gave me Water and then Tea ,that WAS great kindness of them,my true repsect, then i came down to Alex ,Wandra and Georg. and Also met other Sherpas, particulary, mingma, Lakhpa ,Sange and then Satya Dam Ji, at Camp III there were Alex my spanish friend and two other friends, they were planning to go to the summit of Lhotse, Alex was in tears of joy to see Samina summit Mt.Everest in such young age and Being first female. they also gave water, juice and energy drinks, i gave my mask to Sange and Regulator to Lakhpa cheetah. then start our descend to Camp II, it was Hard climb due to exhaustion , Samina was almost Exhausted. since she was climbing for 34hours continuously, i was carrying her bag pack and was leading her down the Lhotse Face, the sun disappeared and the dusk was getting around, the temperature was dropping down quickly the lhotse face lower section was freezing and No many people assailing down the face. the rope was also freezing and that made the assailing tough ,i repelling down the face and slaked the rope so Samina could repel too, it took us long to reach to the base of Lhotse face, it was almost now dark and Samina was absolutely Tired and exhausted. but was not giving up, when were going to the summit , we had left our walking poles at the bottom of the Lhotse face, reaching Lhotse face bottom we took our poles and that helped samina very much, we walked down in the dark toward Camp II, on the way we met wo of our cooks with Juice kettle and cups, Seven Summit treks are very much professional in this regard, after taking Juice we kept on going toward Camp II, finally we reached Camp II exactly at 8pm, after 24hrs of continuously climb ,Camp IV to the summit and back to Camp II, its just incredible feat of bravery! we reached Camp II at 8pm ,all tired and then sleeping time, at Camp II Sanju was also resting and had to share tent with him, i told samina we should go to base camp the very mornng but she said ,No we should waite for Tashi & Nungshi those who were resting at Camp III after summit. in the night it was like crazy.Sanju had the issue with oxygen and was shouting ,telling me to get him bottle oxgyen, there was bottle of oxygen in the tent but no regulator, i tried to call Mingma and Lakhpa but no news... it was very upsetting all night Sanju couldn't sleep .. and the sherpa's were also very tired and deep asleep,i couldn't sleep that night and in the very morning Sanju left for Base camp. we kept waiting for Tashi & Nungshi, then the arrived in the noon. we shock hands and shared the stories... night was calm and then morning to leave for base camp. we left for base camp, samina and the other twins were tired but all fine went to camp I , through the ice fall was tired but funn too. when we reached base of the ice fall ,our cook was there with juice and tang. we enjoyed Can juice and arrived Base camp, fresh food ,hot shower was nice.lots of congratulations and hugs from the base camp , specially from the great stuff of SEVEN SUMMIT treks . Tashi, Nova and Dawa. they were very excited and Happy for us. after lunch, i charged my satphone and also the mobile to contact home. all was cheering and breaking news every where.. i was happy... then there was a call from my brother ,saying that there is press release from Alpine club tat i am sick,wich was NOT nice... i was angry.. and then put the news not to share anything unless i am back.. i wanted to tell the project and its theme ..so was little confusion in the news! Camp III (7100m ) to (Camp IV 7900M & Summit PUSH!!! the night was perfect,some how we could sleep a little , Samina in the morning Mingma wake up early and start making soup. after soup,we start putting on our boots and harness. around 6am,we start our climb,Tashi & Nungshi Tent was on the left side of the fix line, when we were ready by the time,they were ready too. we said hello to Each other and the climb Start, today there were a large number of climbers heading to Camp IV and weather window for today till 19th May was said to be the best, the chines ,the indian army, NCC team of India and several others were there too. the line was large above us and behind us, we continued the climb in a nice pace, we crossed some above upper Camp III. then the pace was nice, the blue ice and the gust sometimes made it difficult, we met many climbers comng down from the lhotse Face,the lhotse face blue ice was incredible to climb.was fun. the people descending the mountain made hard to cross each other, then the Lhotse Face Travers was interesting to do, then the hardest part was Yellow Band, going through Yellow Band with crampons on it made things very difficult :) specially big crowd and lots of people trying to over come each other. the rest at the Yellow band for two minutes ,the view from there was UNBELIEVEBLE. i took some shots ,since photogrpaher i used to take photo of Samina all the time, then did the Geneva spur and finally arrived South col.Camp IV. while going through Genvea spur i could see one guy pulling one guy above Lhotse Camp IV, later i was told that a Thaiwani guy got sick and exhausted while trying LHotse ,the helicopter did two rounds but the wind didn't permit it to come closer to the Altitude hit climber. it was amazing to see helicopter at this altitude ,i must solut this Pilot!!! he did try his best to resuce him but weather didn't permit. Above Genva spur the rock dry section is hell. i put off my crampons and then walked to the Camp , half way Nungshi also arrived and we walked together, i was tired ofcourse, but made the film all the way to Camp IV, which i bet is best shots! 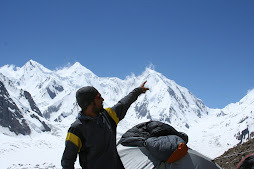 reaching camp IV and looked at the summit ,it was amazing.. i went to the our tent, which Lakhpa had already erected. Samina Arrived before me,since i took time filming the clouds /time laps at the top of Geneva Spur. samina was feeling amazing strong and fine, the way she climbed all the way from Camp III to camp IV was remarkable! After tea and soup, we rest for a nearly two hours, then Lakhpa made soup for us, Mingma attitude i found different after Camp III, he was not very cooperative or helpful, i saw his half hearted response ,if i asked him something. however Lakhpa made soup for us and then our hydrated food that i brought from Pakistan. while having our soup and getting ready, heard lots of people leaving for the summit ,some people started as early as 6pm in the evening,we left at 8pm,Nungshi and Tashi left before us ,Me,Samina, Lakhpa and Mingma start the climb,at a gentel pace. when we start at the glacier, suddenly Mingma turned back without saying anything to me, Lakhpa was ahead of me, Mingma told him something in Nepali, then lakhpa told me ,that Mingma is going back to the camp and will come back, i wondered why he would go back.. any way, we over took some slow climbers then got the pace, Lakhpa was behind us, i was in the fron of Samina, kept on changing her safty carabiners and jummar.she had the mitten so was difficult for her to change the carabiner. the night was completely Dark and the headlamps in line made the climb amazing, we could see climbers climbing on Lhotse as well and climbing through the Chimmini was amazing, there were around 11climbers on Lhotse but nearly 100 plus on Everest, a large number of People were ahead of us and same behind us, we were almost the middle party, half way Tashi was ahea of Nungshi ,we cought up with Nungshi,she was slow and i said we wouldn't let you behind and go ahead of you, we followed her pace up to Balcony, while resting below Balcony at the bottle neck, up to this point there were me, Samina and my sherpa Lakhpa, samina sherpa was NO where! at the rest place at the bottle neck a guy said i am sherpa of Pakistani girl, it was surprised then Lakhpa told us that ,Mingma was sick and turned back ,Tashi (Manger) sent alternative sherpa for Samina, that was interesting and new sherpa,we never knew him or met him before,he said his name is Norbu sherpa, looked good man. we start the climb ,reached Balcony there were alot of people resting and changing Oxygen bottles, we did reach there too ,and drunk water and changed oxygen bottles, i did some film and most of the people were comping up to the balcon. After taking some rest ,some water we start above balcony, after sometime, then i decide DIFFERENT/STUPID FOR MANY!I TURNED BACK!WHY? well, i in my early updates or write ups said, how i wanted and struggled to involve women in outdoor sports especially Mountaineering, it was not easy ,the way i start back in 2006 when i first draft my proposal for women expedition. that was hard times, when no one understand me and my mission, i realised working as mountain guide that men,women come all over the world to Pakistan, Gilgit-baltistan but no domestic adventurers,expeditions.. and NO female at all!!! 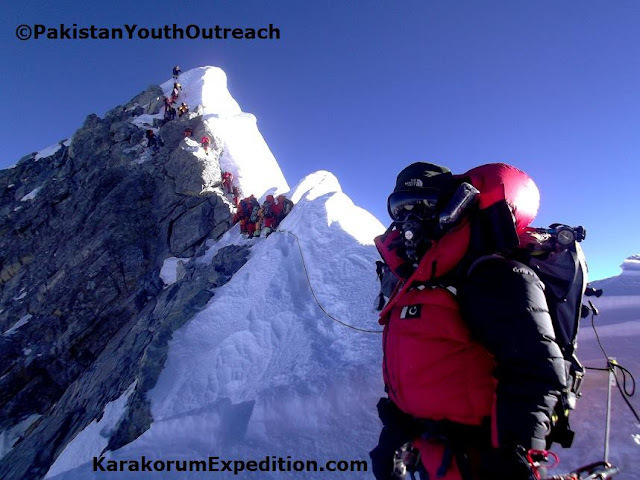 so that was my mission to empower women through adventure sports.and promote outdoor sports in Pakistan through my program "Pakistan Youth Outreach" the expedition we have is for Gender equality that means both of us as brother and sister are climbing together that fits perfect in our project (mission) "first Pakistani Gender Equality Expedition Mt.Everest 2013" then it came to the point,how i porve it or claim that i empwower women??? that was the main reason i turned back! when you reach at 8600m its above death zone all gets tired,slwo and out of breath but that was not the matter that i can't reach the summit which was around 248m short form the summmit (according to Mingma durje sherpa), why i turned back was to make it back to my fellow people in Pakistan that ,if i train my sister, i teach her, i provide her opportunity and finaly trust her that she is capable to reach the summit on her own, the message to fellow Pakistani men was that they should also encourage and provide opportunity to their sisters,daughters and wives and encourage them what they are capable of doing within their field of work and interest! there was some news that i was sick,if i was sick would that be possile for a sick climber? 3> is possible for a sick climber to make hot water and give to other climbers(Arjun Karki sherpa Pemba sherpa and himself)? 6> if i was sick that day, i had another three weather windows and i had three full bottle of oxygen and two half used. I turned back to south col. it was pretty fast descend , while going down there was a light coming out of a tent, when i reached south col. that was mingma, he came to me and said all right? i said yes, and went to my tent there was no one, Mingma was disappeared (Samina's Sherpa) i then went to Sanju tent, Sanju and Pemba were sleeping, i pulled my sleeping bag and tried to sleep but couldn't , somehow there was a little sleep time but my thoughts were there with Samina and her climb and waiting for the News!!!! After good rest at CII for one day, today we left for CampIII, we left for CIII around 10am, the sun was up but not hot till now, we put on our down suits and then helmets. Me,Samina ,Tashi and Nungshi and the sherpa’s start the climb, half way met Ashish and his team mates. They greet us and I took a group picture .Sanju and his sherpa had left before us, I catch up with them at first crampon point, we didn’t put crampon here, I thought better to put the crampon on below Lhotse face. We kept going fast, me and samina left Tashi & Nungshi behind and reached below Lhotse face. We took rest and water, we me prem there, the entire Indian Army team, they encouraged and appreciate samina, said very good words, specially the Major(forgot his name). There was big line now on Lhotse face, me, Samina and her sherpa pushed through the steep section and start the jumaring.Lakhpa my sherpa had already gone to CIII in advance to put up the tents. Through the steep section of Lhotse,it was great climb, the sun was up and the heat was on top ,wearing -55 down suits and the strong reflection of sun made it hard to climb,we removed the upper of the down suits, tie the sleeves around the waist and kept on climbing, then reached CIII ,7100m,Lakhpa had already put up the tent, we drunk water then got in to the tent, first I called home and relaxed, hot water served and then soup. At 5pm, I put bottle oxygen for Samina, my plan was not using bottle oxygen but samina said, Bhai don’t take risk.. she said are you sure ,not using bottle oxygen. ..i didn’t want to demoralize her or give her stress not using bottle oxygen, I said, I am also using bottle oxygen, I then put the bottle oxygen, to keep her strong, in the evening Mingma made soup for us and put some food from our dehydrated food that I brought from Pakistn, after enjoying we got in the sleeping bag. Today was rest day, Nungshi, Tashi arrived at Camp II at around 12or 1pm, and then the laugh start. I rest well and everything was perfect. Today few people from our group went for the summit push, Arjun dai,Ursula,Novoko,Swee,Yuki,Greg . Ursulu left some medicine for me for emergency for the summit day,Dex.tab and Dex injection . Sanju and I again shared the tent and the night was again rough ,since Sanju had sleeping issue at CII,when we came on last rotation, I put him oxygen bottle, and tonight I fear the same, but then we had fun chat and well sleep. As per my plan we left for CII at 3am, Mingma & Lakhpa were there as well Sanju and his sherpa with us,we moved fast through Khambu, in the beginning Samina was slow but after Dam,she got the pace, we over passed several people in Khambu ,we took just one break for water in the ice fall, we arrived at CI within 4:30 hrs, I reached in 4hrs and Samina with other people arrived half hour later, the previous night was tense and I didn’t sleep for single moment, so I felt sleepy at CI,I got in to a tent for short nap but it was very hot inside the tent, I couldn’t sleep, then moved toward CII ,Samina and mingma were ahead of me and Lakhpa was behind me, I over pass Sanju , we reached CII within two hours, it took us 6hrs to reach CII from Base camp, which was pretty fast compare to our first rotation .Samina made it within 6:30hrs, but for me it was 6hrs. the heat of today between CI & CII was unbelievable, it was burning hot!!! I had less water and the heat was so strong, I got dehydrated, I have always issue with my side pain, if I drink less, and today happened the same, I drunk less in the burning hot weather at western cwm, when I reached at CII,I felt pain in the right side,I asked for the medicine from Novaoko, she gave put cream on it, and said its muscle pain, today I was carrying a pack which was pretty heavy, meal was served, then went for sleep, Nungshi & Tashi didn’t come with us today, so me and samina shared tent, we wanted a day rest at CII before going for the summit push, that was the reason we left one day earlier. Tashi, Nungshi didn’t come because they wanted no rest at CII. We relaxed at CII. since I had no proper sleep last night, I fell to sleep but the right side Pain was there till now, I asked my other fellow climbers, But Novoka, being nurse said its Muscular pain, which I normally experience if I don’t drink much,Cheung the chines came to our camp, I asked him ,he gave a plaster type, that I put on the side and then In the morning after drinking nearly 8liter water, the pain was gone, the meal of dinner was not Nice, so I didn’t eat, also I threw up, after coming in the heat and lunch was fish, I ate a lot and threw up later in the evening ,so didn’t want dinner, though ate little rice.!!!!!! Tomorrow is rest day and Tashi,Nungshi will join us . VERY WELL DONE SAMINA BAIG, YOU ARE TRULY INSPIRATION TO MANY OF US!